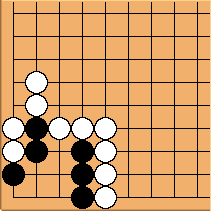 This page I hope will become a place of discussion for players to place go problems which have confused them in some way, even after seeing the solution. Many of us (beginners, mostly, maybe, maybe not) have encountered go problems that are devoid of discussion. Whether the answer is given or not, some problem sources do not have the goal of discussion in mind. This page is meant to fill the gap. If you've found a problem you don't understand, and isn't explained, discuss it here (or present it here for discussion). Basically, this differs from other, similar pages in that it is meant to address specific problems that a given player wonders about. kb: The solution is a case of capture two, recapture one. 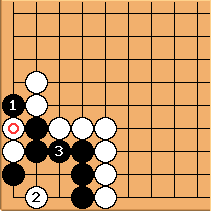 kb: Instead of playing at a to save the stones, it is played to make an eye in combination with . When captures, Black can recapture at to form two eyes and live. 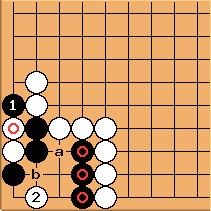 kb: Why can't Black just capture the two White stones and live? 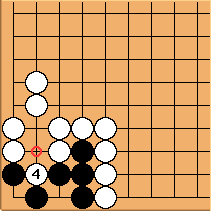 If White plays 2 at , then Black can play to live. 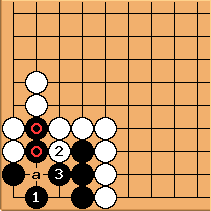 However, White has a better way to play. The vital point has been revealed to be the right 1-2 point, so White should play there. 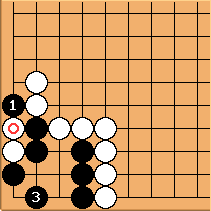 Since this move is sente to capture the three stones (W can push in, starting at a, Black must defend at b - but then White throws in at and Black dies. atimholt: Thanks for the instantaneous response. I'm a beginner, and will have to look this over a couple times before I really get it.